We spent three nights at Lebala and each evening we had a beautiful sunset while we enjoyed our sundowners. If you’d like to know about the camps we stayed at, Lebala and Little Kwara, you can read my TripAdvisor reviews on the camps here and here. If you’d like to see more pictures, I’ve created a bunch of albums that you get access from this page. I found several photos that I had incorrectly tagged, so were overlooked then when I was creating the post, Death of a Hippo. These show what was left of the hippo about 2 days after she died, and the scavengers still around. This photo is the first in a series that some people may prefer not to see. We were on safari, staying at Lebala Camp. 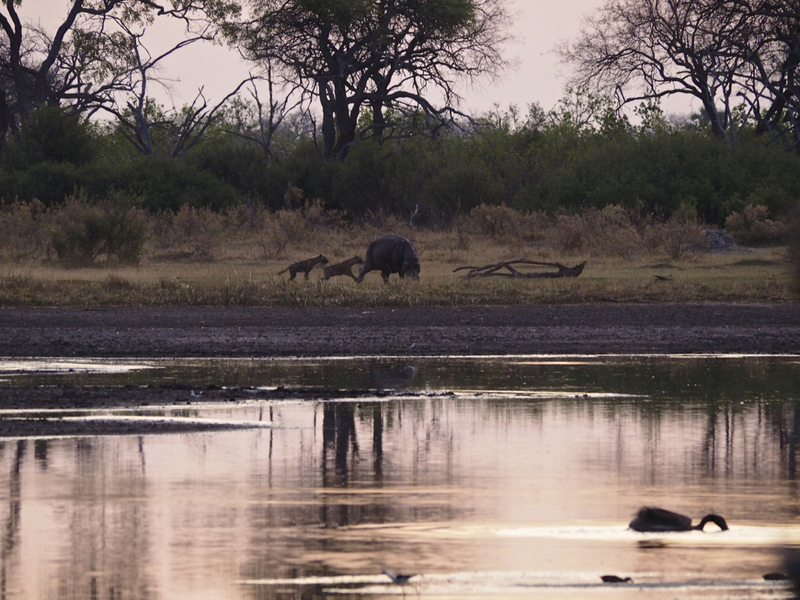 We had stopped by this lagoon for sundowners when I spotted activity on the opposite shore. It was a hippo being attacked by two hyenas. I gulped down the rest of my G&T and our guides hurriedly packed stuff away and we raced around to see what was happening. On the next page, there are pictures showing the attack in more detail. They aren’t pleasant and you may prefer not to look. For the six of us in the Land Cruiser it was a lesson in the hard facts of life on the Africa plains. The hippo had clearly been badly injured in a fight, probably with another hippo—two hyenas would not have been able to take down a healthy one. I’m posting these two pictures because it was the first time I’d ever taken photos with a shutter speed of 1/8000 sec; this seems to be too fast for WordPress media library as it reports 1/501s. Other meta data: ISO 160, f/2.8, -0.3 EV, 40mm. The camera is an Olympus OMD E-M1; the lens is the Olympus 12-40 f/2.8 Pro. The Falls were pretty amazing even in the low season without much water. I’ll be posting more photos in a new album when I have finished processing and weeding. I like the way these came out. The Prague astronomical clock could be seen from the window of our hotel in Prague. It is, according to Wikipedia, the oldest working astronomical clock in the world. It attracts a crowd on the hour to watch The Walk of the Apostles as the clock chimes. The clock continues to chime through the night, though I cannot testify to the size of its audience at 4am. Last Monday Gia and I fly to Prague to join Sharon—a long-time friend from Hong Kong—and three of her friends on a roadtrip from Prague to Vienna. We spent a couple of nights in Prague, then onto Český Krumlov for two nights and then on to Vienna, with a boatride between Melk and Dürnstein, for two more nights. Our guide and driver was Ari, who will be 75 next week, but still retains an enormous enthusiasm and passion for his work: “Ari’s Travel Club—traveling with passion” is his strap line. Ari has an aparently encyclopaedic about the places he took us: talking (lecturing) on history, art, culture, architecture… Ari’s patience was rather strained by the five Chinese women in the back of the bus who were much more interested in chatting about who-knows-what than listening to Ari. We saw some beautiful scenery and architecture, and ate some good, and some not so good, meals. I have a few hundred photos to sort and process in the next few days, then maybe I’ll write some more about the places we visited. I’ve been playing some more with the very excellent Waterlogue. Here area few pictures from our recent trip to Petra that have been given the treatment.